Today we tell the story of how one of the most recognizable names in smoking has thrown their hat into the e-cigarette ring and just how well they’ve fared. A name so synonymous with smoking that for a long time I didn’t know there was another term for a cigarette paper. I’m talking of course of Zig Zag who have recently partnered with V2 in order to release their very own Zig Zag Disposable E-cigarette. 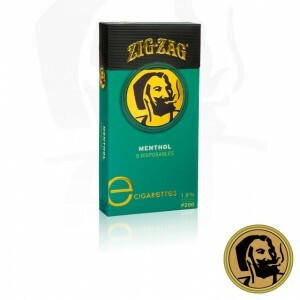 One of the first things you’ll notice on the package is the familiar face of the Zig-Zag Man and the fetching color scheme of the e-cigarettes. While looks are certainly not the most important criteria it does show that Zig-Zag wasn’t sparing any expense when designing their product. The e-cigarette itself is mostly white and looks quite elegant with a black filter finished with gold lettering and an outline of the The Zig-Zag Man. One of the things we were a little disappointed with is the fact that the tip glows orange with no other options available. If you’re anything like me you often find yourself smoking your e-cigarette while out on the town in a bar or at a show. When I do so I always prefer a product that glows an odd color so there’s no confusion among security whether it’s an electronic cig or the real deal. Battery life is another area where this e-cigarette excelled. While I’ve become used to disposable that last a couple of hours or so at the most I felt like I got a solid day and a half of good use out of this one. I feel the need to clarify that I typically go through disposables very quickly and the fact that this one lasted a little under two days is no small feat. I tend to puff quite hard on my e-cigs as I was a heavy smoker. Typical products don’t last as long as advertised, in this case, 200 puffs. With this product I’m pretty confident I must have reached at least in the ballpark of 180 puffs which is noteworthy. I’m sure I must have been hovering close to the 200 puff mark. The 400 puff variety also performed quite well and I would say it pretty much performed exactly as I would have expected following my experience with the 200. Vapor production is actually quite decent and ranks highly among other disposables but is not recommended for long time or heavy smoker who may need something a little thicker to feel satisfied. With that said, this would definitely be a good alternative for lite smokers as an introduction to vaping before springing for one of the advanced starter kits. We found the vapour to be fairly rich and satisfying though a little tame for the experienced vaper. 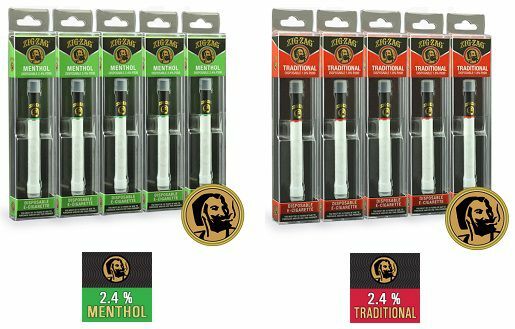 Not surprisingly, like their V2 Disposable counterparts, the Zig Zag e-cigarettes are currently only available in 2 flavors. You have the option of choosing standard tobacco flavor or menthol. The Zig Zag disposables are available on the V2 Cigs website and come either in a 5 or 10 pack. There are 2 varieties of disposable, either the 200 puff option or the 400 puff option. No surprises here as you can pretty much expect the 400 puff model to last you about twice as long as the 200 puff. The 200 puff packages will run you $18.63 for the 5 pack and 29.01 for the 10 pack. The 400 puff packs are a bargain with just a 2 dollar price difference with the 200 model. The 400 puff model rings in at $20.70 for the 5 pack and $31.08 for the 10 pack. These purchases are also included in V2’s loyalty program so make sure to bank your points for extra goodies down the road! This is a top notch product in the world of disposables but really, we expected no less from two of the biggest names in the industry. We highly recommend this product to first timers looking to learn the ropes. With that said, we’re really eager to see what Zig-Zag can do next.